Habit: Perennial herb from branched caudex. Stem: slender, gray-tomentose. Leaf: cauline, alternate, lanceolate to ovate, entire or toothed. Inflorescence: heads discoid, generally in +- flat-topped clusters; involucre obconic; phyllaries in 1--2 equal series; receptacle flat or convex, epaleate. Disk Flower: generally 11--23; corolla white to cream [yellow], tube > throat; anther base short-tailed, tip narrowly lanceolate; style branches rounded-truncate. Fruit: +- cylindric; pappus of many bristles in 1--2 series. Habit: Plant 1.5--6 dm. Leaf: +- sessile, 2--6.5 cm, glabrous adaxially, white-tomentose abaxially. Inflorescence: heads generally 4--12; peduncle 1--5 cm; phyllaries 5--9 mm, lanceolate to narrowly ovate, generally tomentose, sometimes glandular-puberulent. 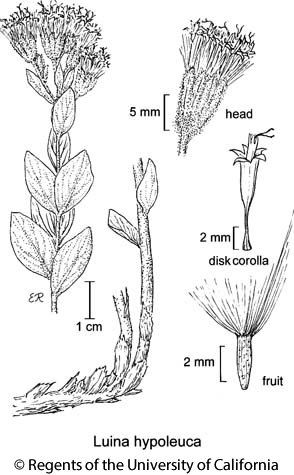 Flower: 11--15(23); corolla generally 8--10 mm, tube 3--4 mm, throat slightly expanded, lobes 1--2 mm, erect. Fruit: 3--4 mm, +- 9-veined, glabrous or strigose; pappus 8--10 mm. Citation for this treatment: David J. Keil 2012, Luina hypoleuca, in Jepson Flora Project (eds.) Jepson eFlora, http://ucjeps.berkeley.edu/eflora/eflora_display.php?tid=3912, accessed on April 19, 2019. No expert verified images found for Luina hypoleuca. KR, NCoR, sw SnFrB; Markers link to CCH specimen records. Yellow markers indicate records that may provide evidence for eFlora range revision or may have georeferencing or identification issues. Purple markers indicate specimens collected from a garden, greenhouse, or other non-wild location.